Humans are consuming natural resources at a rate much higher than that at which nature can regenerate or replenished. We all know that we depend on the nature to meet our energy need. With advancement in technology, per capita consumption of natural resources is growing. Therefore, natural resources are exploited more and more. So, we need conservation and preservation apart from the replenish process of nature that prevent wastage and degradation. Biodegradation is the process of decay caused by bacterial or fungal action. This term has close affinity to the sewage treatment, environmental remediation (bioremediation) and to plastic materials. The microorganisms plays important role in this process of decomposition. They are the real recyclers of the nutrient in the soil. The decomposition mechanism of nature replenishes the ecosystem. Microorganism such as bacteria, fungi plays important role during the course of decomposition of organic substance. It is natural waste management and recycling system. Basically, it breakdown the organic substance through chemical process from the complex molecules into simpler molecules then give it back to the environment. 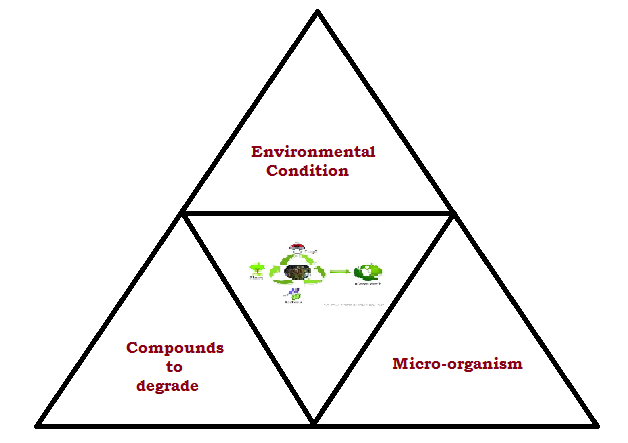 There are four factors that affect the rate of biodegradation i.e. light, water, oxygen and temperature. The degradation rate of many organic compounds is limited by their bioavailability, which is the rate at which a substance is absorbed into a system or made available at the site of physiological activity, as compounds must be released into solution before organisms can degrade them. 1. Aerobic biodegradation: In this process, organic decompositions are done when oxygen is present. In other words, organic pollutants are degraded under the aerobic conditions by aerobic bacteria. 2. Anaerobic biogradation: In this process, organic decompositions are done when oxygen is not present. There are four key components which are involved in the process of anaerobic biodegradation such as Hydrolysis; Acidogenesis; Acetogenesis; and Methanogenesis. Every organic substance are decomposed to anaerobic digestion and transformed into carbon dioxide and methane. Bioremediation is the act of treating waste or pollutants by the use of microorganisms (as bacteria) that can break down the undesirable substances. The decomposition of organic materials in the environment through microbial action then it is called as Biodegradation. It is one of the methodologies of waste management technique in which biological agents are uses to remove contaminations from the environment. It is arbiter by the nature. It is totally engineered process of human. So it is controlled by the human. It can be helpful or harmful. It does not require expert. It requires expert for the designing and implementation of the process. Hence, we can say that Biodegradation is the natural process of decomposition whereas in Bioremediation, organisms are introduced to the contaminated site or enhanced the natural microorganisms by providing suitable growth requirements. The important end result of the decomposition is that organic or inorganic nutrients originally bound up in the fundamental unit of any substances are converted into simple forms that are usable once again. Apart from the processing and clearing of the pollutant, decomposition is vitally important for generating fertile ecosystem. Previous Story What is Black Hole?